Unit sets offer your customer increased efficiency. Omega offers many standard sizes and value-added features for your convenience. We also offer you the most complete line of special features. These include crash numbering, jumbo numbers, consecutive bar coding, MICR encoding and binding into books. 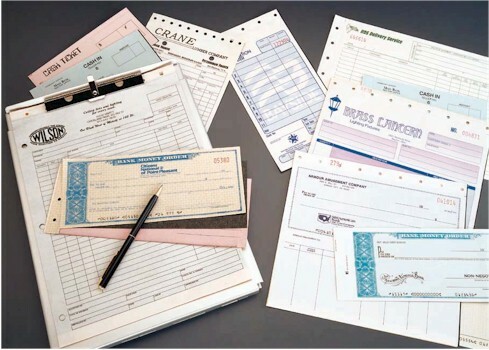 These are bond papers with one-time carbons interleaved into unit sets for either handwritten or machine use. Carbons may be either blue or black, standard grade medium intensity. Generally blue carbons are best for handwritten forms while black carbons are best for machine use. Pasted Stub: All parts and carbons are pasted together in a stub, which may or may not have line-hole punching. A customer can design his form to print parallel with or at a right angle to the stub so that the stub will be at either the top or bottom, left or right. Marginal Words: Marginal words such as "Customer's Copy, File Copy," etc., to denote disposition of parts may be printed in one line of our standard type. Packing: Unit sets are packed for shipment in corrugated cartons. Numbered forms have beginning and ending numbers on the outside of the carton. The quantity of sets in a package depends on the width of the form and parts in the set.